There are days when you crave for nothing but healthy and wholesome home-cooked food, after those guilt-ridden bouts of bingeing. No matter how tasteless, bland or unsavoury the dishes may appear on your table. Or you’re probably a little stressed out to cook in your own kitchen after 8 straight hours of torment in the office. Eating out usually translates to greasy, robust and sinful fares, but of course ….. as in life, there is always an exception to the rules. Piping hot steamed dishes in porcelain bowls and metal plates placed in the steamer for you to choose from. And more often than not, you’d be tempted to pick more than you can eat. Dad has been raving about this place for some time now. Tucked hidden somewhere in Pasir Puteh area of Ipoh, the most prominent landmark had to be the Tow Boo Keong temple (aka Nine Emperors’ Temple on Jalan Tokong). Location details to come at the end of the post, predictably. Modus operandi? You stand around, lining up in front of the steamers, and pick your dishes on the spot. Then take a seat, and they’ll be sent to you. Seemingly, this place is often crowded during dinner hours, and you really have to be there early, else risk missing out on the good stuff, or waiting relentlessly for a seat. The corner coffee shop named Kedai Kopi Tai Kung (Tai Kung Coffee Shop) can accommodate at most, 15 or so tables of patrons. And don’t go thinking that having a meal here is a cinch, for when we were there, the place was really packed to the brim. And this actually says a lot, for this is an eatery with almost zero media fanfare, publicity, nor even barely noticed from the main roads. Okay, first of all, take note that this “restaurant” (still I refuse to refer to them as a coffee shop, for the appearance does belie the true weightage of the dishes they serve, resembling more of a ‘chu char’ Chinese restaurant more than your average neighbourhood kopitiam) opens only from 5.00 pm until 8.00 pm daily. Yes, read that right. Don’t think about suppers, or late dinners, for come 8.00pm, they would have (usually) run out of steamed dishes to serve you. Oh ya, you don’t get deep-fried squids, salted egg fried chicken, nor spicy crabs or Kung Pao mantis prawns here at Tai Kung. 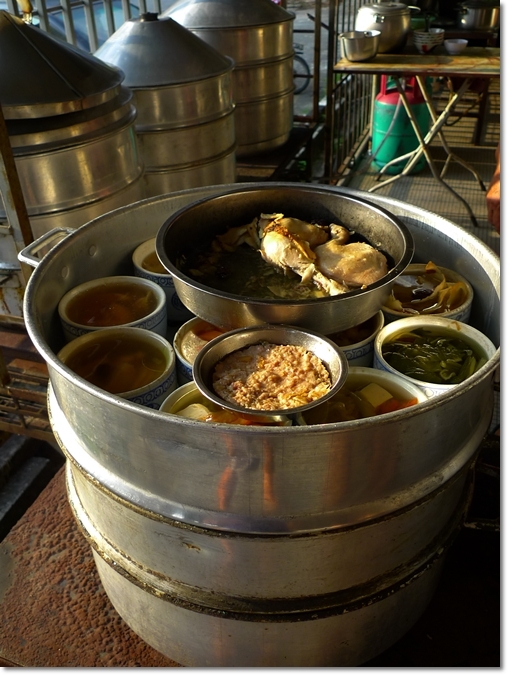 What you get are essentially pre-cooked dishes, kept warm in the steamers, and dished up upon orders. Of course, some dishes like steamed fish (you can choose the head, the tail, or the belly) and blanched greens are still cooked per order, for obvious reasons. We were initially not aware of their concept, and parked ourselves comfortably at our table, patiently waiting for the staff to walk over and take our orders. To which we started to wonder, why on earth were they standing around idly, while we were wagging our tongues in starvation (almost) and perspiration started to build up from the imminent hypoglycemic attack?! Ahem, luckily, the boy who served us our drinks politely commented that we should walk over and choose our dishes from the steamers at the back of the shop, instead of waiting aimlessly. Whoops. Nobody said this was a “SELF-SERVICE” restaurant in the first place. So considered yourself warned, okay? Anyway, all was forgiven and forgotten once the man lifted the covers, and the amazing whiffs of sumptuous steamed dishes reached our senses. 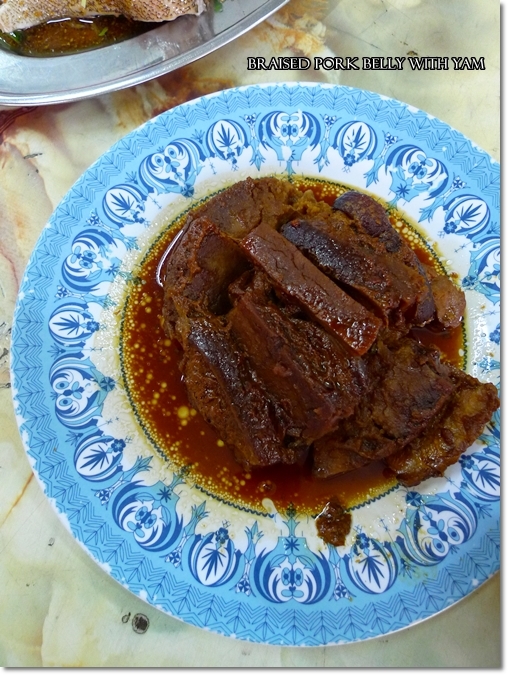 From classics such as “Tung Poh Yuk” (Soy sauce braised FATTY pork belly cuts), Salted vegetables with Pork, Stewed Chicken Feet with Groundnuts, Steamed Herbal Chicken, and some endearing choices of double-boiled soups such as the homely ABC soup (potatoes, carrots & onions), and preserved mustard (choy kon) soup. We almost went into overdrive and pointed recklessly at the various metal plates/porcelain bowls of delightful home-cooked fares. But since there were only three of us, we held back the glutton thoughts. Anyway, the “Tung Poh Yuk” was lovely, for the pork belly was cooked until tender and really flavoursome from the thick, dark sauce. Not the melt-in-mouth variety (ala Bee Gaik‘s), but still delicious enough to warrant an order or two. 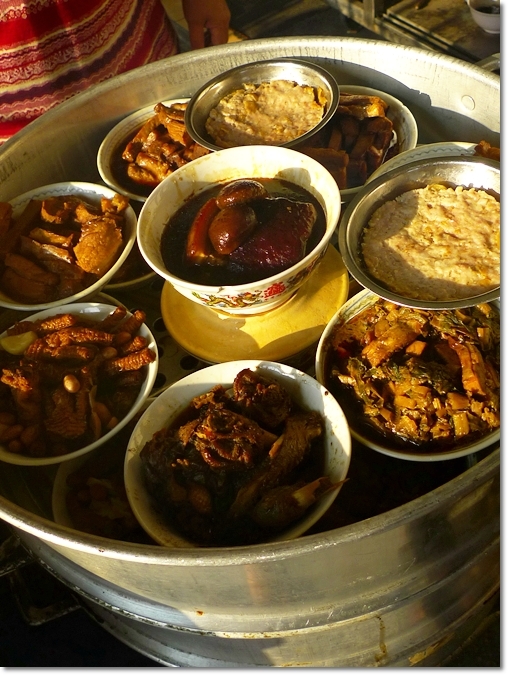 But skip that thought of having seconds, for you can savour the other pork dishes here. And you should. 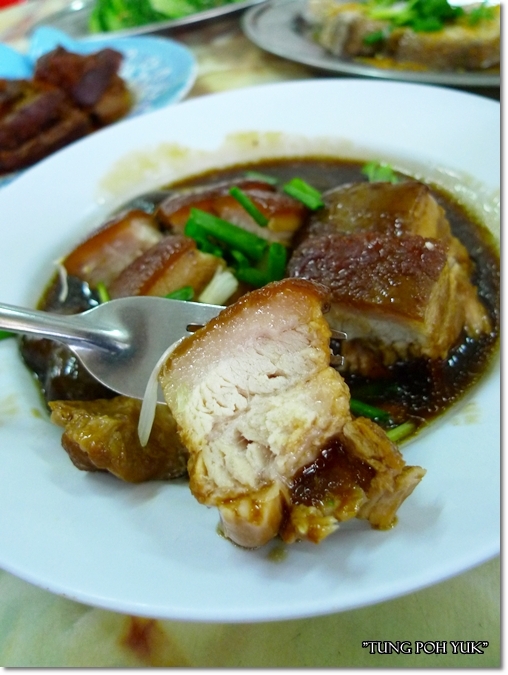 The “Woo Tau Khau Yuk” or Yam and Pork Belly is another perennial favourite, judging from the number of hits the dish managed to score on almost every table. And rightly so, for the steamed soft, mushy yam was complemented perfectly by the marinated pork belly (less fat compared to Tung Poh Yuk‘s), sandwiched alternately between each other. 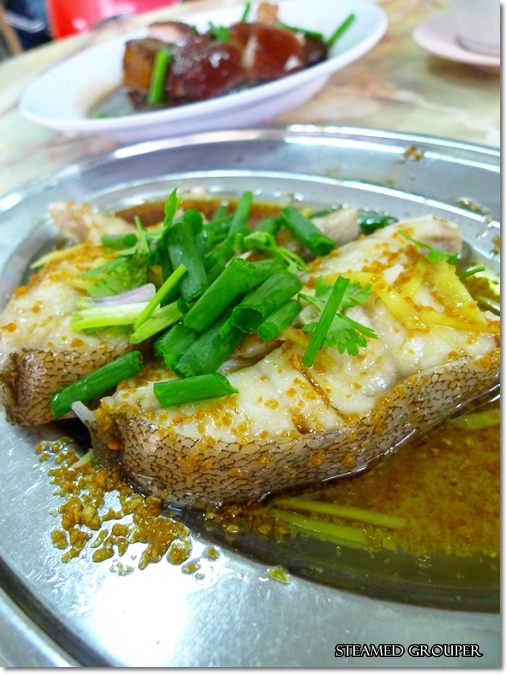 And don’t miss their steamed grouper in a basic soy sauce, sesame oil and shallot oil combination, garnished with fried minced garlic and chopped fresh coriander and scallions. Something grandma used to cook since the olden days. If it’s not broken, why fix it, right? Hence don’t bother to ask for fancy fusion style of cooking, for you’re better off dining in some posh establishments elsewhere. At Tai Kung, they really stay true to the timeless classics. And complete your meal with a serving of their double-boiled soups. 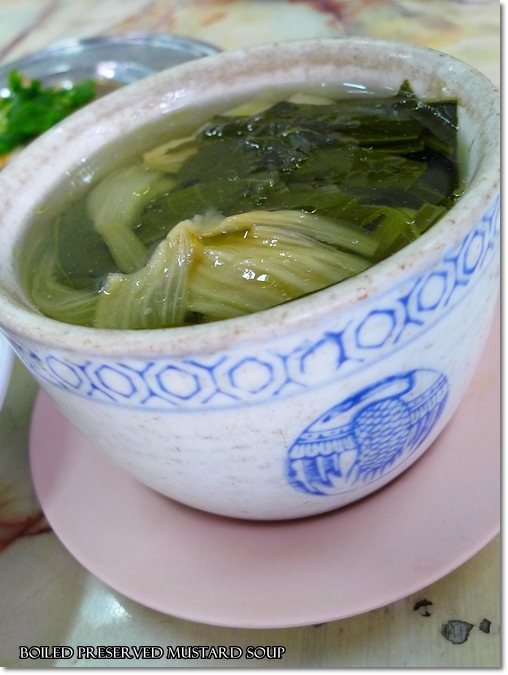 We picked the preserved mustard (choy kon) soup, which arrived still piping hot, and with pieces of chicken feet thrown in for good measure. Inconspicuously charming. Don’t miss this if you’re in Pasir Puteh area for dinner. The meal came to only RM42/USD12 for the three of us, inclusive of rice and drinks. The dishes could easily have fed 4 person, for we were struggling towards the end of our meal. Business hours : 5.00pm – 8.00pm daily. Refer to the GOOGLE MAP if you’re lost. Directions : Coming from Jalan Kampar towards Jalan Tokong, when you reach the roundabout before Tow Boo Keong temple, take the 12 o’clock turning. You will pass by the temple on your LEFT. Right after passing by the temple, before you reach the traffic lights, turn LEFT into Jalan Chung Ah Ming. 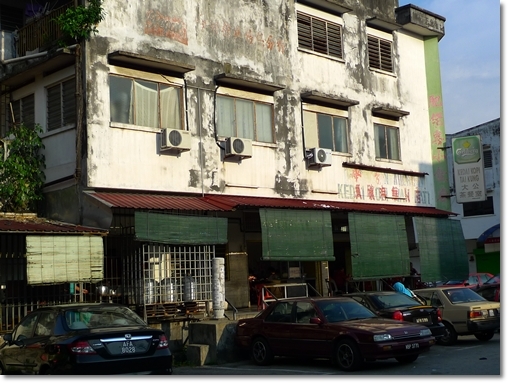 You will see Kedai Kopi Tai Kung on your LEFT. Interesting way of ordering food. Kind off the Teochew way of serving but this is already in bowls ready to be served. Yeah, you will feel almost like eating at a chap fan (economy rice) stall, but you only get to pick, then they’ll serve you at your table. wow wow wow…. nice place for food!!!! Yeah, we love pork. Almost redundantly huh? Interesting concept. I’m all for old school cooking! Me too, maybe we’re growing older faster than we can savour each and every moment! I don’t crave for fast food that much nowadays. steamed groupa.. magic words! i wanna eat here! Not a problem, available almost everywhere in Chinese restaurants. Just beware of the premium price some places may charge. Oh, this is not easily seen from the main road, nor walking out from the temple. You have to turn in ONLY you can see this simple, unassuming coffee shop. great place to order and eat. Shiok! Ipoh got lots of yummy food! I miss bean sprouts from Ipoh. 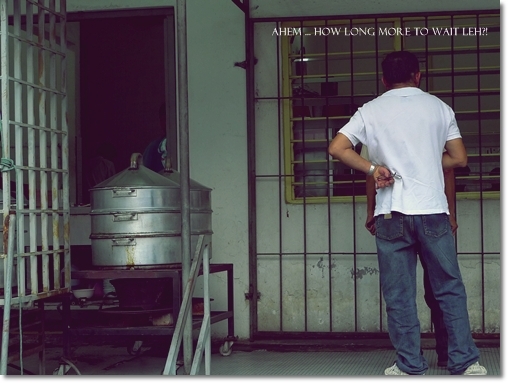 I hope to find this place (for lunch) as I will be making a stop over in Ipoh soon. CK, they only open from 5-8pm daily, except Wednesdays. okayyyyy motormouth this is creepy to the fact that I wanted you to recommend this sometime ago!! i absolutely love the herbal chicken drumstick! goes absolutely well with rice! also the soups are great and the ‘kou yuk’ is not bad too! downside is you have to be there really early like 5-6pm. any later than that nothing good is left. Hi there Disgusted. You’ve had a bad experience there before? Mind to share? Arrived shortly after 5pm to takeaway. Normally restaurant worker will ask you what you want. This people didn’t bother. They acted as if I was a nuisance and didn’t bother to acknowledge me. So I took the lead and found out that they weren’t ready and had to wait at least 10 mins. Waiting is not a problem but the attitude they take is something I cannot stomach. Acting as if I was a pain in the … and not even telling me that they weren’t ready… hey, does being polite not exist in their makeup? Is it a sign of weakness in the dog eat dog world of being in the food business? Come on, am I not a customer? Thanks for sharing, Disgusted. I was not aware of the attitude, though I have to say during my first visit there, I was surprised after about 5 minutes of being seated, they did not bother to come over and tell us how to order our dishes. Instead they gave blank stares. Luckily the boy who took our orders for the drinks assisted us, only we knew it was a self-service eatery. I like it, all the fatty staff. I’m from Penang, this is very unusual! Been there few times. One of the cheapest place for dinner. Have to be there by 7pm else most of the steamed food will be finished. 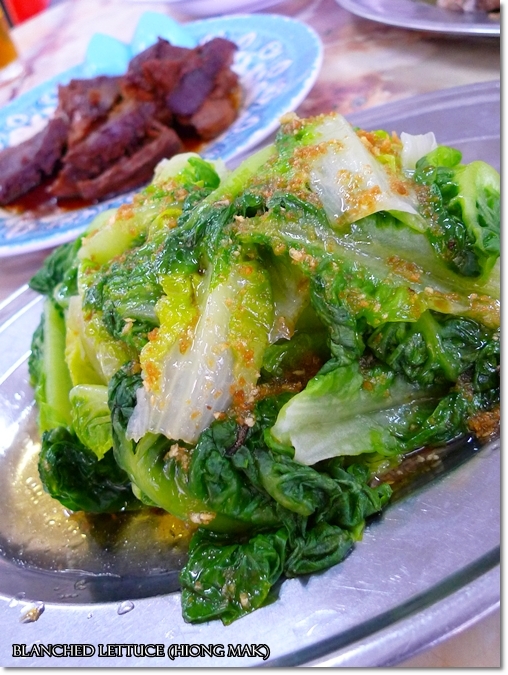 The steamed minced pork is one my favourite dish there. Greetings I am so glad I found your site, I really found you by accident, while I was looking on Digg for something else, Anyhow I am here now and would just like to say kudos for a incredible post and a all round thrilling blog (I also love the theme/design), I don’t have time to go through it all at the moment but I have book-marked it and also added in your RSS feeds, so when I have time I will be back to read more, Please do keep up the excellent work.